I'm more your comfy shoe type, how about you? Me, I will suffer for fashion. If the shoe is bitchin' I'll wear it. My they are beautiful, in a neck braking, crippling kind of way! My ankles twist just looking at those shoes! I'm just here to have a look! Me too!! However being a huge fan of cute shoes, if I was about 20 years younger, that pair on the left would absolutely appeal to me. When I find shoes that are both comfortable and cute, it's the jackpot of the year. 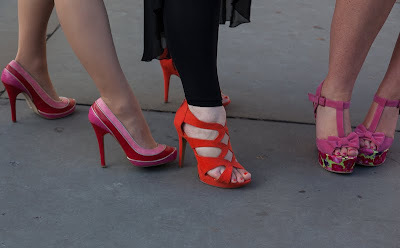 I still don't get how people walk around in the city with crazy heels. That being said, I like the shoes in this picture. But they are such fun to see:) Great vignette of amazing shoes! I'd break my neck but I like that pair on the left a lot! Love to look at, can't walk on it. I'm a comfy gal, too, but those shoes are really cute! FUN, but looks COLD and not shoes I could use for hours. I wish I could but... no. The pair on the left is my favourite too, but I just can't walk in heels like that and sometimes I think some women who wear them can't either. In your photo they do look good though. Love the look, but I'm definitely a comfy shoe person these days.